ColecoVision.dk Homebrew Section Presents: Michael (Mike) Hemming Dullum. Michael lives in Maumee, Ohio, but has also spent time in Dowagiac, Michigan and Toledo, Ohio. Mike Dullum is very good to make design for ColecoVision boxes, also Manual design and the text for it. He have helped with Manuals for OpCode Games, Daniel Bienvenu, Luc Miron and Jean-François Dupuis. Michael was also a beta tester for the ColecoVision 128-in-1 Flash MultiCart for ColecoVision. Mike was also a writer for ColecoNation for few years ago. Known is he also for his modified joysticks and ColecoVisions. 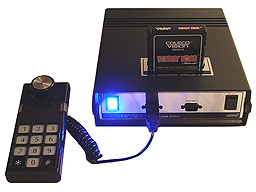 Mike created this ColecoVision above, and mounted it with a "topsecret" Videochip. Has even AV out, internal power supply and skip Bios. It can be hard to get in touch with Dullum, you can try it via AtariAge.